Osaka, after an Allied incendiary bomb run. From U.S. Army in World War II, Pictorial Record, The War Against Japan, Section VI, page 447. During the early morning of November 1, 1944, an F-13A named Tokyo Rose (a photo-reconnaissance version of the B-29) left Saipan. Its mission was to fly over Tokyo and Nagoya, photographing aircraft and engine plants. Over the next several weeks, F-13s flew seventeen more sorties over Japan. Using thousands of pictures to help them pinpoint their targets, American bombing crews were ready to severely damage Japan’s war-supply industry. The first strike on Tokyo was November 24th. Bomb crews, in the ensuing months, crippled or destroyed various facilities such as the Kawasaki aircraft plant, north of Tokyo (January 1945). When Japan controlled Iwo Jima, its island-based fighter planes would frequently intercept American bombers on their way to Tokyo. Those defensive activities would end if the island were in U.S. hands. Many more Allied planes, carrying incendiary bombs, would be able to reach the Japanese capital, and damaged or disabled B-29s would have a safe place to make emergency landings. On the 4th of March, while the battle for Iwo Jima still raged, a crippled B-29 (dubbed the “Dinah Might”) made an emergency landing on an American-controlled Iwo landing strip. Beginning on March 9, a fleet of B-29s reached the Japanese home islands. 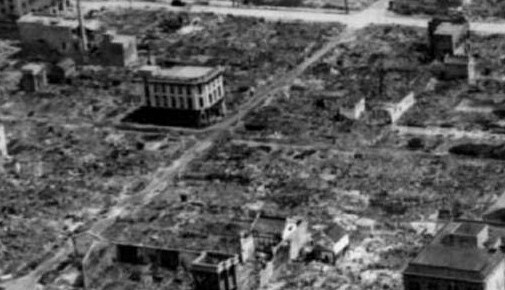 Their carpet-bombing caused tremendous devastation in key Japanese cities. The bombs (known as M-69) were filled with jellied gasoline called napalm. Nearly 1,700 tons of those bombs fell on Tokyo - a city of wooden buildings - shortly after midnight on March 10, 1945. People who were still in the city were shocked at the conflagration. It is estimated that between 83,000-100,000 died. Stacked up corpses were being hauled away on lorries. Everywhere there was the stench of the dead and of smoke. I saw the places on the pavement where people had been roasted to death. At last I comprehended first-hand what an air-raid meant. I turned back, sick and scared. Later I learned that 40% of Tokyo was burned that night, that there had been 100,000 casualties and 375,000 left homeless. A month after the March raid, while I was on a visit to Honjo on a particularly beautiful cherry-blossom day, I saw bloated and charred corpses surfacing in the Sumida River. I felt nauseated and even more scared than before. We ourselves were burned out in the fire raid of May 25th 1945. As I ran I kept my eyes on the sky. It was like a fireworks display as the incendiaries exploded. People were aflame, rolling and writhing in agony, screaming piteously for help, but beyond all mortal assistance. Bos, Carole "WHY IWO JIMA WAS CAPTURED" AwesomeStories.com. Oct 01, 2006. Apr 18, 2019.